Over the past few years, podcasting has enjoyed a resurgence in popularity. With renewed enthusiasm in the commercial and “do-it-yourself” segments of the medium, the art of the podcast is quickly evolving. As the content has gotten better and better, the standards for sound quality, sound design, and music have also taken a quantum leap. In my time co-producing and engineering the B&H Photography Podcast, I’ve picked up some useful knowledge that’s helped me create better-sounding podcasts. In the paragraphs below, we’re going to explore some tips and techniques. If you’ve already started podcasting, then you’ve probably already felt the wrath of the dreaded vocal plosive, whether you know it by name or not. A plosive sound is an unwanted, low-frequency “pop” that occurs most often by a speaker vocalizing the letters “p” or “b.” While there are ways to eliminate these unwanted annoyances in post processing, it’s obviously best to avoid recording them in the first place. 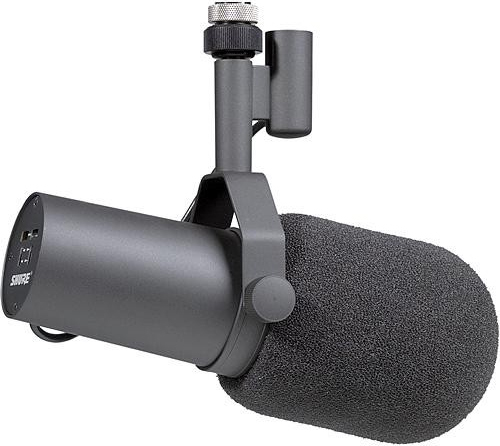 Unless you’re using a broadcast microphone with a built-in windscreen, such as the Shure SM7B, Electro-voice RE20, or RØDE Procaster, it would behoove you to invest in a pop filter to help catch plosives before they’re recorded. If a windscreen or pop filter doesn’t seem to be eliminating the problem entirely, it’s also a good idea to experiment with the angle of the microphone capsule relative to the sound source. Moving the mic slightly off-axis from the speaker's mouth can further reduce vocal pops, and help you to record cleaner audio. We’ve all heard audio that’s tiring on the ears. While there are many factors that can contribute to harshness in a recording, a common cause of harsh vocals is an excessive presence of sibilant consonant sounds, such as “ess” or “shh.” You won’t run into this problem with every speaker that you record, but when you do get someone in the studio who speaks with overly accentuated sibilance, you’ll often find that it’s a chronic condition that requires specific treatment in post processing. Most often occurring in the 4-9 kHz range, sibilant sounds are pesky, but usually can be tamed with a mixing plug-in called a de-esser. Most DAWs come with a decent stock de-esser, which can be instantiated in your vocal chain to temporarily reduce the level of high-frequency content in the signal when a sibilant sound is present. I like to apply de-essing after compression in the chain. While compressors are handy for leveling out the dynamics of a vocal performance, they also tend to accentuate sibilance; thus de-essing is generally better suited to come afterward. Editing your show can make a huge difference in your audiences’ listening experience. While a super-tight edit of the content itself may or may not serve the format of your show in particular, segmenting, or editing the arrangement of the dialog to some degree may be beneficial. In any case, annoying “ums” and “ahhs” that serve no real purpose are usually best eliminated, as they slow the pace and can be unflattering for the guests and/or host. When editing the B&H Photography Podcast, we generally go for tight segments, making sure that the subject matter stays on topic and is arranged concisely. We aren’t afraid to move pieces of dialog around to improve the organization and dynamics of the conversation. This can be quite time consuming. A great way to speed up the process of editing podcasts, or any post production dialog for that matter, is to learn your DAW’s keyboard shortcuts. As a Pro Tools user, “keyboard focus” mode is my greatest ally when editing dialog. It allows me to cut, fade, and zoom with single keystrokes, which is extremely helpful for quickly chopping up and smoothing out dialog when necessary. No matter what DAW you use to edit, you can bet it has its own set of shortcuts, and an easy way to learn them fast is by using a custom editing keyboard that has the command functions printed on the keys. Room ambience and vibration from things like air conditioners, computers, and cell phones can and will show up in your recordings. Adding a fairly steep high-pass filter to each of your vocal tracks will make a substantial improvement in sound quality, as it will clean out any excess low-end information that would otherwise cloud your mix. Start with a 12 dB-per-octave roll-off at 100 Hz on each vocal channel, and adjust as needed. Of course, there is a lot more that you can do with EQ to improve the sound of your vocals. But, high-passing your vocals is an important first step that doesn’t require any technical know-how to speak of, and it can improve sound quality in a big way. If you’re having serious issues with hum and buzz in your headphones, you might have a ground loop. Ground loops are really common when recording with a laptop in combination with a USB audio interface, although they can occur no matter what kind of setup you’re using. If you are using a laptop and having hum problems, try unplugging its power supply and run the computer on battery power while it’s still connected to the interface. Does the hum go away? If it does, then it’s a ground loop. Luckily there’s a safe and inexpensive solution. 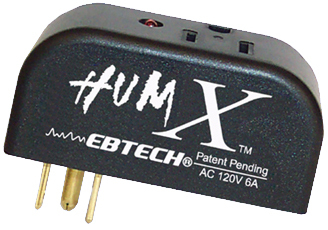 The Ebtech Hum X filters out unwanted voltage and current in the ground line that causes ground loop hum, while simultaneously maintaining a solid and safe ground. By the way, never use a “ground lift” to remedy this problem. While lifting the ground may also make the hum go away, it’s dangerous and leaves you vulnerable to the possibility of being shocked or worse. Using a ground loop isolator is a much safer solution. Most podcast producers don’t have the luxury of recording in a professionally treated acoustic space. Along with EQ, noise-reduction software can really help make up for a less-than-quiet recording environment. 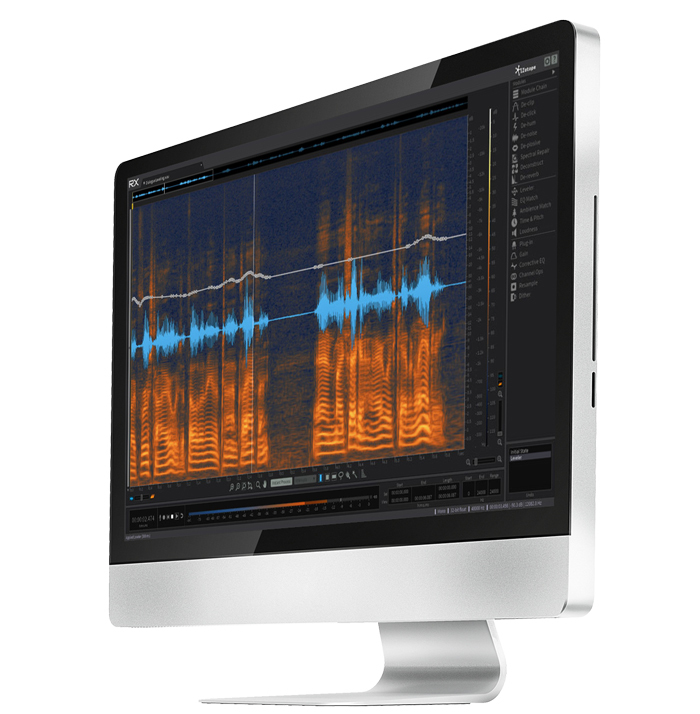 iZotope RX 5 Advanced offers comprehensive tools for cleaning up hiss, crackle, and even vocal plosives. If you want to achieve that tight, quiet, studio sound in your garage, you can get pretty darn close to it with noise reduction. If you’re a more experienced engineer, this may seem obvious, but to newbies it may be a revelation. One thing that can’t be fixed in post processing is a digital clip. On average, try to keep your input levels around -18 dbFS on the meters in your DAW, and don’t let them peak at more than -10 dbFS, give or take. This will ensure a healthy signal with ample recorded level, without risking a nasty digital clip when someone laughs or gets overly excited. Hopefully, this list of suggestions has been helpful. I encourage you to leave any questions or thoughts you may have in the Comments section below, and happy podcasting! Great writeup for those new to audio recording and who don't have the benfit of working with others who can teach them all these things. I was fortunate not only to work with people with decades of experience, but to also listen to them and learn from them. This is almost as good, so kudos! One could also follow the style of the No Agenda Show and run live to recording. Adam Curry (yes, from MTV) and John C. Dvorak host, but Adam is also filling the live producer role of playing clips and managing the sound quality. He's found some really good software solutions that imitate rackmount equipment, so he's able to keep the same general sonic signature for the show when he's not at home using a laptop. He does do some minor post after the live stream before publishing the podcast, but it mainly consists of pulling a clip from that show to add to the very front of the show. They used to have to do more to cut out technical difficulties with Skype dropping out, but that hasn't happened for a couple of years. Give it a listen and keep in mind that what you hear is how they recorded it. You can find it at noagendashow.com or any podcast app. Thanks for checking it out Mike! Thnks ... this kind of text article about the basics of digital audio recording is not easy to find. It's clear & well-written, and sure would make a great video (YouTube) so that points & tips could be viewed and heard. As helpful as this piece is, it reminds me of a radio program I once heart about learning to paint. Thanks, and great feedback. I'll definitely think about posting audio examples for future articles like this. Very informative article!! I was debating whether or not to go into pod-casting because of all the "in-n-outs". But, this article helped to clear some things up. I really liked this post. Try to keep on the subject of Podcasts, it's amazingly important because there is a lot of people jumping on Podcasts and we really wanna hear more because we're mostly amateurs of sound. I've bought a Zoom R16 almost two years ago, but I've never used on my macbook, because there was not driver for Mac to use my sound software of my adobe package. Do you know if this problem was solved? Thanks for reading! What version of OS X are you on? The R16 is has been officially qualified to work on OS X 10.5.8 or later and 10.6.5 or later.